No regional qualifiers for the second straight year, so the August tournament will once again be open to all comers. The 2015 USARS Roller Derby National Championships will be held in Philadelphia, Penn. on August 28-30, USARS announced today. 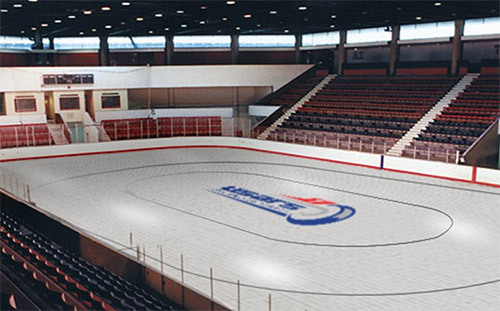 Together with host club PA All-Stars, USARS will hold the tournament on the skating rink inside the Class of 1923 Arena at the University of Pennsylvania. The event will mark the fourth national derby championship event for USARS, but the first to be held east of the Mississippi. As in previous years, the tournament will be primarily for women’s roller derby teams affiliated with USARS. However, the event can be expanded to include additional categories, such as for men, juniors, and co-ed teams, if there is interest from enough teams to accomodate them. Last year, USARS cancelled its summer regional qualfiers at the suggestion of interested teams, instead opting to hold a single, open national tournament in Stockton, Calif. The reasoning behind this was to avoid forcing participants to play in two tournaments when they may have only been able to afford to travel to one. Last year, a “good response” was eight women’s teams, the number of partipants at Nationals 2014. Among those teams were this year’s host PA All-Stars and eventual repeat champions, the Oly Rollers. Come this August, we’ll see how many teams, more or less, make the trek to Philly go for USARS gold. No complaints about how this location will make 75% of the teams from last year travel all the way across the country? If this was the WFTDA you’d be jumping up and down and foaming at the mouth. At least you are predictably inconsistent. If they bother traveling at all. There will probably be fewer west coast teams at nationals this year, but that may be offset by more eastern teams. I don’t have a gauge on how many would be interested/capable of going yet, because it’s still too early to tell. But I’m going to tell you now that I won’t be surprised if participation is down again. Oh, and since you decided to bring it up: I criticize WFTDA on travel considerations because it has the resources and the numbers to make travel easier for many more of its teams, but it chooses not to do so. For christ’s sake, it even says in its own documentation that a goal is to keep teams within “reasonable driving distance” for the playoffs. If USARS was flush with cash but still forcing teams to spend unnecessarily, I’d be chewing it out just the same. You’ve got no clue how what the WFTDA does to make things easier for their members. There is a reason USARS is in the state they are in financially. This isn’t going to help them. There you go again, mixing up the organizations and getting all confused. It is darling, really.